With the DC Barrel Crew's Flanders Red almost ready to bottle after a year of aging in a red wine barrel the debate began over what the next beer into the barrel should be. 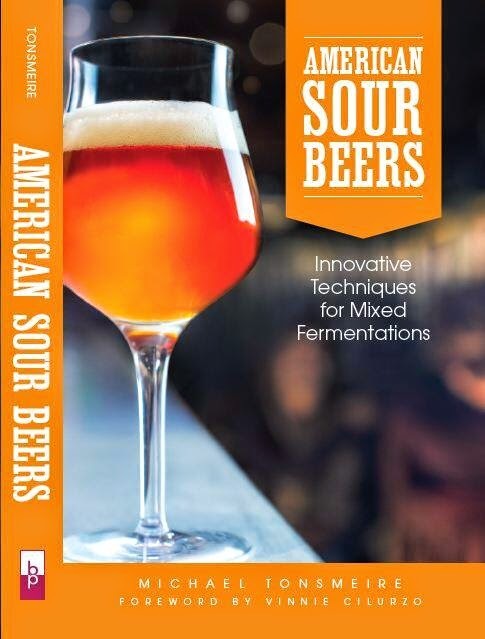 There were plenty of suggestions, but most people wanted a sessionable sour beer. My mind instantly went to the best beer I have ever tried, Russian River's Beatification PH1 (aka their Belgian Single, Redemption, aged for 23 months in barrels New Belgium had used to sour La Folie before investing in larger oak tanks). That single bottle of Beatification I drank nearly three years ago was sour, but balanced; funky, but fruity; dry, but not thin; and just amazingly complex. As a side note, after Batch 001/PH1 (001 was just aged in a different barrel) Beatification became a very different beer. It is now a spontaneously fermented American Lambic (Sonambic) aged in old oak wine barrels that have already had most of their flavor extracted by multiple batches of other more wood/wine forward Russian River sours. It is still a great beer, but neither batch 002 nor 003 were at the same level of complexity and balance that the original attained. A few months back I saw a post on HomeBrewTalk that reported the recipe for Redemption straight from Vinnie, and having a now used Flanders Red barrel I knew what the plan should be (luckily I was able to talk the rest of the guys to go along with it). We tweaked the recipe slightly, dropping the late boil addition of Sterling hops since there won't be any hop aroma left after the time in the barrel. We also went with a hotter mash temp than I would have for a crisp dry beer like Redemption because the microbes in the barrel will appreciate a bit of extra fermentables. 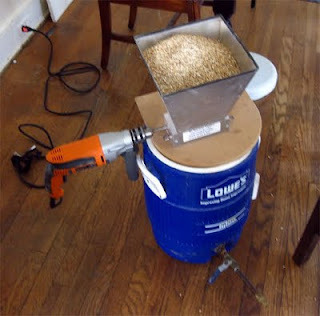 It was also my first time using my new drill to run my Barley Crusher (no more sore forearms on brew days for me). It was easy to connect, just unscrew the manual handle and tighten the drill onto the shaft. For my portion of the batch I switched the bittering hop from Styrian Goldings to US Fuggles, which are the same hop variety just grown in a different country. I also used some extra wheat malt because I was a short on pils. Finally I used White Lab's 500 instead of 530 because that is what I had on hand for another single I was planning on brewing. None of these substitutions should have much of an impact on a beer once it is soured. The brew day for the beer went smoothly, and fermentation took off quickly. Now that fermentation has finished up I am giving it some cold conditioning until October 24th when we will be bottling the Flanders Red and then filling the barrel back up with this beer. It is on the right, next to a batch of extract single (left), which only looks a half shade darker (more on that one later). 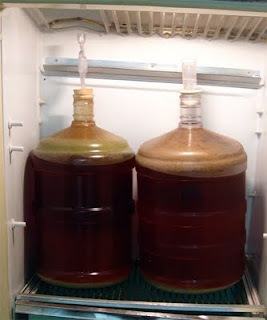 If you don't have enough friends willing/capable to brew 60 gallons of beer, or you don't have a used wine barrel with microbes in tow then you could try brewing the beer and tossing in an ounce or two of French oak cubes soaked in red wine, add them along with the dregs from a few of your favorite sour beers to the secondary. 1.50 oz. Fuggle (Pellet 4.30% AA) @ 60 min. 0.25 Tsp Yeast Nutrient @10 Min. 3 qrt starter (wheat DME) made ~48 hours in advance. 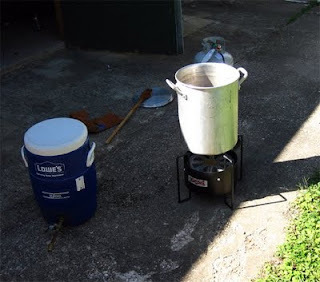 Mash ran a bit longer than scheduled because the burner lost its flame while heating the sparge water, due to the wind. Moved into the garage (door open of course) and the problem was solved. Collected 7.25 gallons of runnings with a fly sparge. American Fuggles used from my SoFB winnings, AA% adjusted down from 4.8% as they are about a year old. Hit gravity/volume well. Chilled to 78, then placed in the chest freezer overnight to drop the rest of the way. Pitched half of the starter in the morning at around 64 degrees. Some fermentation evident after ~12 hours. Rocking fermentation 24 hours after pitching. It threatened to blow-off, but never did. 9/19/09 Boosted the temperature up to 68 to make sure fermentation finishes out. 9/24/09 Dropped the temperature down to 35 to help clean the beer up. 10/02/09 Racked to secondary. Topped off with some of my extract single to ensure that I had a full 5 gallons of beer to contribute. Left at room temp until barrel day. 10/24/09 Racked into the second use red wine barrel that had held Flanders Red for 12 months. Did not clean out the barrel, but pumped out most of the trub before adding the beer. 1/15/09 First sample after 3.5 months in the barrel, starting to develop a light Bretty funk, basically no sourness. Nathan's basement is ~50 so we probably won't get much bacterial action until the warmer months hit. 8/7/11 Bottled with 5.9 oz of corn sugar per 5 gallons and rehydrated wine yeast. Assuming ~.4 volumes of residual carbonation we should get about 2.6 volumes of carbonation. Racked 1 gallon of my share onto about 2 lbs of white nectarines. 10/19/11 The result of the long wait is rich in oak, acidity, and complexity. Not saying it is exactly the same, but it certainly shares many common traits with the original (of course that is based on a single bottle five years ago). 11/5/11 Bottled the resulting 3/4 gallon of the portion that had been on nectarines with ~1 g of rehydrated Premier Cuvee and .5 oz of table sugar. Blonde Ale aged in New Belgium La Folie barrels for 23 months. Batch 001 is softer on the palate than Batch 001 - PH1. The PH1 batch was aged in one of New Belgium's favorite barrels. Refermented in the bottle. Why such a long mash? I just tasted the Westmalle clone last night, and no signs of any off flavor, but it's fermenting a bit slowly. As it says in the notes at the end of the recipe: "Mash ran a bit longer than scheduled because the burner lost its flame while heating the sparge water, due to the wind. Moved into the garage (door open of course) and the problem was solved." so, no inclination for a turbid mash on this one? Also, the relatively tiny amount of vienna...do you think this will have perceivable impact on the finished beer? The original beer didn't use one, so I saw no reason to go to that extra level of effort, particularly when you have multiple people brewing it many of whom have never done one. That small amount of Vienna would certainly be at the taste threshold (even if we were talking about drinking this beer fresh), but I think it was worth adding because apparently Vinnie thinks it is worth it in his beer. Looks nice Mike. How much color/aroma/flavor do you expect to get from the red wine barrel? Did it just have 1 batch of beer done in it so far? was it already fairly neutral as far as winemakers were concerned? The Flanders Red (the first beer in the barrel) does not have a huge wine or oak character, so I am certainly not expecting much of either for the single. The barrel had been used multiple times for wine, so it isn't too surprising. How is the batch tasting? Beatification is one of my absolute favorites and I'm looking to start my second another sour batch. If your batch is shaping up nicely I think I'll try it. The sourness still hasn't come around. The original Beatification was aged 23 months, so we still have some time for it to get there. If it doesn’t improve we’ll probably give it some more bugs and feed it wort/honey to help things along. If you like Beatification Batch 2 and higher that is a different beer. It is brewed similarly to a Lambic with aged hops and a spontaneous fermentation. Vinnie does a complex mash for that one including a sour mash to drop the pH before the boil. Have you ever attempted to fully attenuate with a yeast and transfer adding say some honey and dosing some critters in? That was actually the next beer that went into this barrel. We fermented the base beer out, then added it along with a few pounds of honey to the barrel. Adding honey (or any fermentables) that early will actually feed the primary yeast more than the bugs, wait a few months if you want to make sure the Brett and bacteria get fed. Sorry for the newbie question. I thought you were supposed to use minimum IBUs for sour beers but your seems on the high side. Hops at that level inhibit most strains of Lactobacillus, but not Pediococcus. You can have a flavor clash, but that is usually with even higher bitterness. 25 IBUs on brew day is down close to the flavor threshold by the time the beer is ready to drink. Likely no advantage to going that high, but it worked for Russian River, and I didn't want to try to improve on perfection!